You won't find Emily Schoen dancing in theaters. For the past five years, the founder of Schoen Movement Company has been taking her sinuous, exuberant performances to unlikely spaces: parks, streets, and breweries. 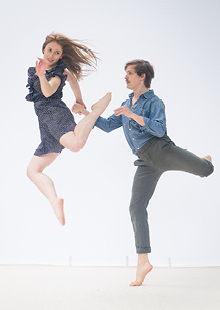 With a mission of uniting people from different demographics and exploring inventive and fresh avenues of dance performance, Schoen — one of Dance Magazine’s “Top 25 to Watch” — has earned three invitations to Jacob's Pillow and praise for work that “beautifully melded a crisp, balletic quality with a light casualness” (The New Yorker). The chance is yours to experience an exhilaratingly unique, on-site performance at Rufina Taproom. Prepare yourself for athleticism, humor, and jaw-dropping innovation! "Big Dance in Small Spaces" at Rockaway Brewing Co. - Highlights from Emily Schoen on Vimeo.